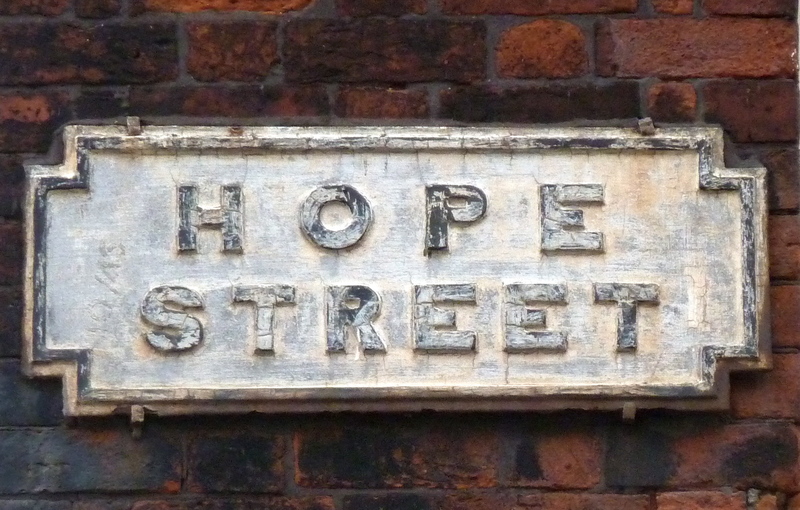 We’ve been working over the past three months to gather information, ideas, histories, poems, stories, photographs, and videos about Hope Street and the area sometimes called the Hope Street Quarter. Very shortly we’ll launch a separate blog called Hope Street Chronicles, a link to which will appear in the blogroll and here. Apart from its own rich historical significance, Hope Street is on our doorstep (we meet in Pilgrim Street) which makes it accessible to our work. The journalist Ed Vulliamy claimed that Hope Street is an allegory for Liverpool. And Liverpool is an allegory for Britain. This claim was in quite an angry piece we’ve discussed in which the writer complains about some aspects of ‘development’ in Hope Street and the City. 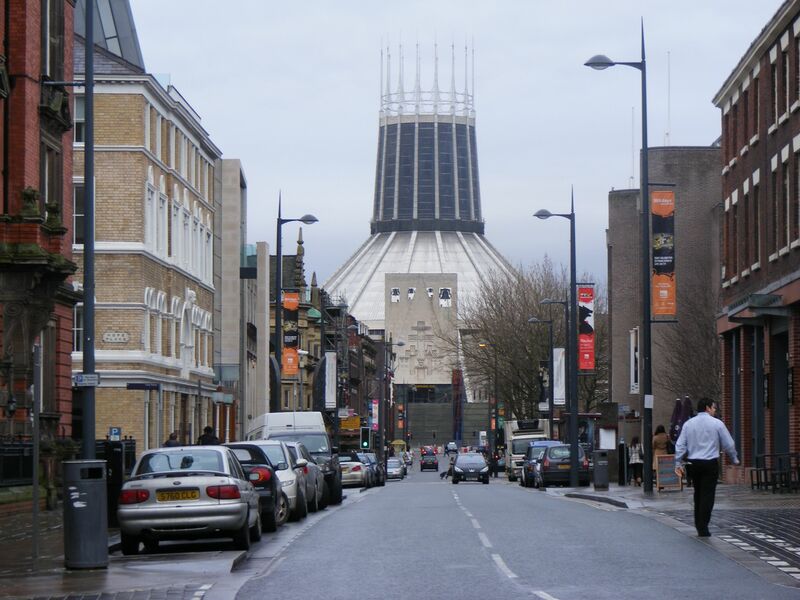 Another journalist, David Bartlett, suggests that In many ways Hope Street has become a microcosm of the tensions across the city between protecting Liverpool’s heritage and developing for the future. This is a theme we’ve looked at and will continue to do on Inspidered where we’ll continue looking at broader aspects of Liverpool at the same time as being engaged on the Hope Street project. Hope Street Chronicles gives us a chance to develop our own production skills. It also reveals in practice that there are very many ways of approaching ‘making history’, especially ones which employ imagination and unusual angles. In looking at Hope Street (and the city) we aren’t looking to find a ‘true’ picture of history, people, culture and so. Rather we hope to discover the energy of life itself, past and present, with all its celebrations, joy, contradictions, disagreements, pain. The museum, to which entry is free, is opening in two phases with three galleries, Global City, Wondrous Place and The People’s Republic, opening in the first phase. Global City explores Liverpool’s links with the rest of the world and its position at the centre of a 19th Century trading network. The People’s Republic gallery looks at the impact of daily life on the city. Exhibits include the first Ford Anglia to be produced at Ford’s Halewood plant and a recreation of 19th Century court housing where people lived in overcrowded unsanitary conditions. Further galleries will open later in 2011 including a carriage from the Liverpool Overhead Railway and 1838 steam locomotive Lion. The two ends of the Museum are marked by large windows eight metres high and 28 metres wide with views to the Pier Head and the river. One slightly ironic aspect of the museum’s design is that not everybody is happy with it, nor the black pyramidical apartment block behind it. 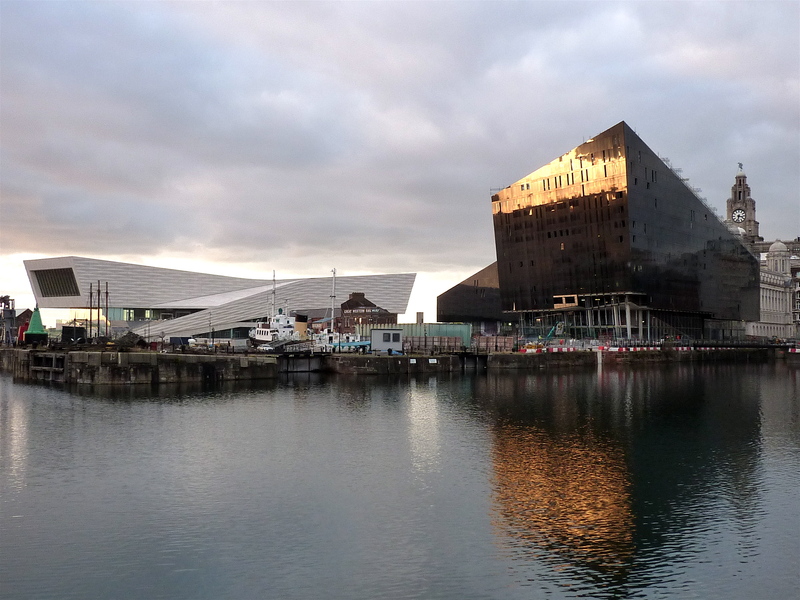 It’s felt by some that Liverpool’s heritage, its ‘historic waterfront’, is spoilt by the futuristic buildings. 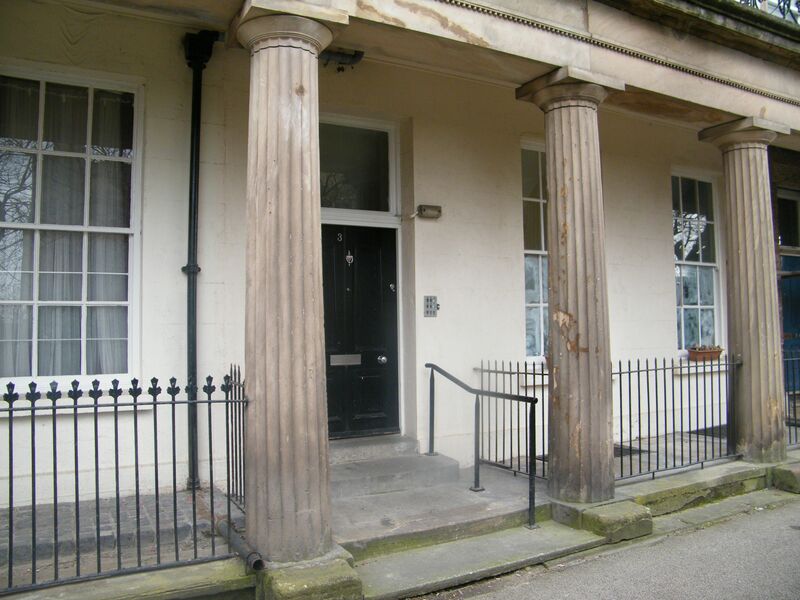 the Department of Culture, Media and Sport (DCMS) has expressed concern that the development could have an impact on the site’s world heritage status, which applies to several parts of the city centre including the waterfront, and the warehouses and merchant’s houses around Duke Street and the William Brown Street area. “All parties agree that regeneration of the area is important; however, there is considerable concern that the current proposals from Peel Holdings may have an impact on the Liverpool World Heritage Site,” a spokeswoman for DCMS said. She confirmed that there would be a joint World Heritage Centre/International Council on Monuments and Sites mission to Liverpool, likely to be in the autumn, to examine the Liverpool Waters proposal and its potential impact, and to assess planning procedures and the overall development strategy for the site. A spokeswoman for UNESCO said the delegation would be checking that the planned development “would not harm the outstanding universal value of Liverpool”. Peel Holdings said it would not comment on a live planning application. We’ll be reporting on the ‘consultation’ we had and discussing the proposals very soon. The question of how important heritage and conservation do (or don’t) conflict with with development will form one aspect of Inspidered’s upcoming Hope Street Project. The project will consider Hope Street as a microcosm of the city as a whole from this aspect (but will be deeply involved with Hope Street as a place in its own right. Look out for more details soon).